I have chosen 3 important skills that are taught in this story. I also have included a vocabulary definition match, making words center and ABC Order with vocabulary. Plus several printables and flap booklets. I am very happy to offer this FREEBIE to you. I wanted you to sample my Journeys' supplemental materials so that you know what's included before you buy more stories. I am in the process of revising the stories. I do have Units 4 and 5 listed, but still need to add a few pages and revise some as well. Right now I just finished Lesson 14, The Big Race and working my way from there. **Please note that if you purchase a story or a unit, you may always go back to "My Purchases" to redownload. 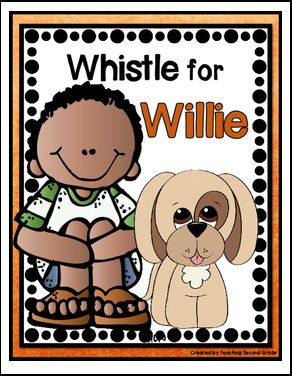 **Spelling Words Booklet ~ Write 2 times, then write in a complete sentence. **Cause and Effect ~ Directions:Read the sentences. Match the cause to the effect. **Comprehension Questions ~ Directions: Read each question. Find the answer and lay beside it. *Vocabulary Booklet ~write the definition for each word. **4 Journal Writing Prompts from the story. Read each clue in the boxes, then decide if it describes Peter, Willie, or both. Glue in Venn Diagram. Your students are sure to enjoy these hands-on activities.